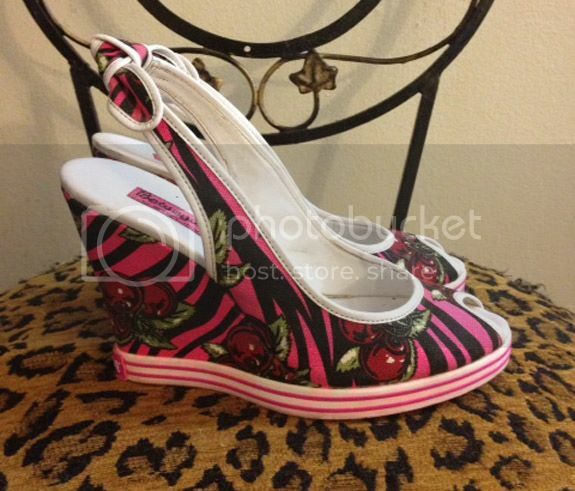 I still really love the idea of these Betseyville signature cherry-print canvas wedges, but they have an athletic vibe that isn't my style anymore. They're a really fun way to style denim and cheeky summer skirts and dresses, however. The wedges are in good condition, but they have been worn a few times. They're super-comfortable because of the approximately 4-inch high wedge heel and half-inch platform. The wedges are size 7. And I'm letting them go for $12. I hope you fetch them!